From the moment I start my hands-on with the demo of Juggler Games’ My Memory Of Us, I’m immediately fixated on the visual style. 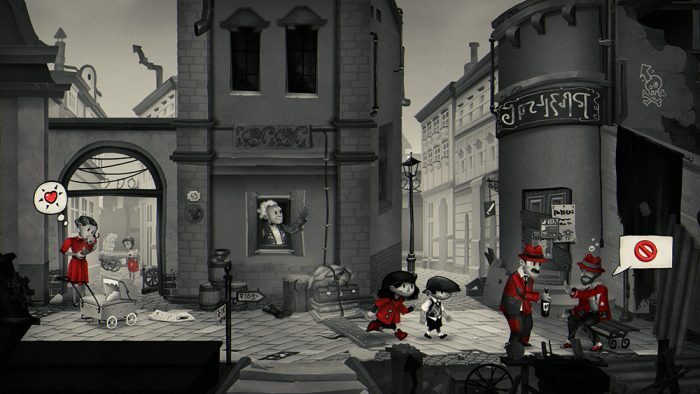 The game is presented in black and white, with splashes of red, and in a storybook hand-sketched aesthetic. I feel like I’m looking at a newspaper, blowing dust off of clippings that were stored in my grandparents’ attic, reading little tales of things that seem sort of familiar. But I’m not. I’m staring at a screen as a story, built on whimsy and childhood magic, unfolds in front of me. During World War II. During death and fear and powerlessness. And yet everyone is smiling. Set in occupied Poland, MMOU doesn’t dwell on the terrors and dread of war, but on the human aspects of our connections to each other. The game takes place from the perspective of two children, who meet and develop a friendship as the world falls apart around them. Let’s backtrack a bit: the game doesn’t take place during war, but during war time. That is, the town that the kids live in has already been occupied, and the citizens are trying to piece together their lives and move on. Kids don’t dwell on fear and hopelessness; instead, kids find ways to have fun, to form bonds, and to enjoy life. My Memory Of Us is about two kids who find extraordinary ways to enjoy life during extraordinarily difficult times. The latest demo drops us somewhere in the middle of the game, asking us to escape from a train and the robotic enemy soldiers aboard. The 2D adventure platforming of the game lets us move left and right through streets, up ladders, down sewers and into buildings. We control both kids, a girl and boy, each with different skills. The boy can sneak and hide in the shadows, while the girl run and is taller, able to reach higher things. In specific situations, we can switch back an forth between the pair. In one area I need to hide behind bushes as the boy and sneak over towards a building where I can unlock a gate for my companion. In another, I control the girl as she initiates a sing-along at a jazz club. All of the actions are done with a simple button press, on par for a 2D game. It can be easy to solve the puzzles at times, like finding a bottle of alcohol in one building and saving it, only to give it to a thirsty man I bump into later on. The puzzles can also be difficult, though not necessarily by design. There’s no real text in the game… prompts are done with icons and expressions and actions, so determining what to do can be a little hard to figure out. I have to pass by a soldier under a scaffolding in one section, but I can’t unless I get him to change his position. I’m supposed to throw an item to distract a worker above him, but I can’t figure out how to aim my throw at the correct angle. It’s not frustrating, but it’s not going to be a cakewalk. Along the way I meet couples having dinner, painters at work, and ferocious soldiers who are somehow dozing off. Set against a backdrop of obvious WWII era imagery, the game capitalizes on the kinds of special moments that we endure as people. To emphasize this bond, the kids can only ever go forward if they’re holding hands. It’s sweet and charming and affectionate. There is no violence in my playthrough, either. All of the actions are undertaken by kids, so while they may throw something they do so to get someone’s attention, not to hurt them. There are no overt symbols, but plenty of symbolism. From the machine-like soldiers of war, to the giant blimps and steampunk trains, we’re clearly in a fear-inducing time. 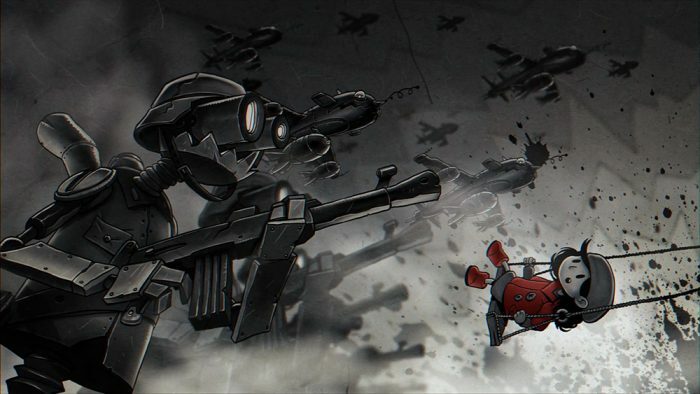 The only colors that appear in the game are splashes of red, indicating both danger and also action. There is a lot of emotion to unpack in My Memory of Us, from fear and hate to love and loss, but we’re given a potentially wonderful way to do it. This is a difficult subject to approach, but Juggler Games has chosen a great format, a fairy tale, to do so. How do these kids keep smiling when the world around them is clearly not right? I don’t know, but I’m curious to find out. Juggler Games has not announced a release date yet.